I just noticed that Easter is early this year! Oh my.....I am way behind schedule on everything!! I had saved this tutorial for bunny treat bags and thought I would share it with you. 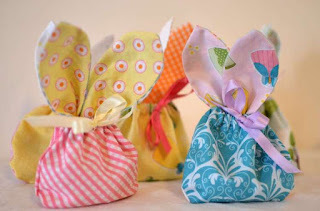 If you have lots of pastel and Easter charm packs that you need a project to make with them this tutorial from Sew Can She would be a good one for them. Great for putting that Easter candy in for all those kiddies.